Older Laser Engravers can now Easily run on New PCs with the newest Design software. Upgrade your old laser engraver PC to a new PC. Get rid of that unsupported Windows 98/XP and get modern! Upgrade now for a fraction of the price of a new brand name laser engraver/laser cutter machine. Do you have an older Universal Laser Systems (ULS) laser machine with an outdated print driver running on an old PC? A simple installation and connections will have your machine running like new machines sold for thousands more than you want to pay. Rock solid, reliable, outstanding quality are just a few of the attributes that come to mind with the LMI laser gravers. Dust off that graver and put it back to work! New electronics technology today makes it possible and practical to put that asset to work to make you money again. Buyers of these machines can benefit knowing the controls can be upgraded and lasers refilled. We receive requests for quotes from eBay buyers examining machinery for purchase. We provide price quotes so that they bid accordingly. 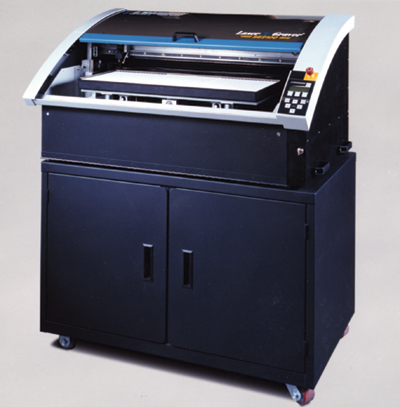 The LMI machines have a quality that is hard to find today, and far beyond the budget of most engravers. Get these machines operating within your budget with our upgrades.